Everyone wants to look their best, and the lit-from-within glow that comes with head-to-toe radiance makes everyone look amazing! This is a look that looks natural and shows off your hair and skin, while making you look younger. It works for everyone, whether you’re a red-carpet regular or your idea of a big night out is dinner at the diner down the street. We have 10 tips for getting a radiant look. Incorporate them into your daily routine to get the biggest benefits. 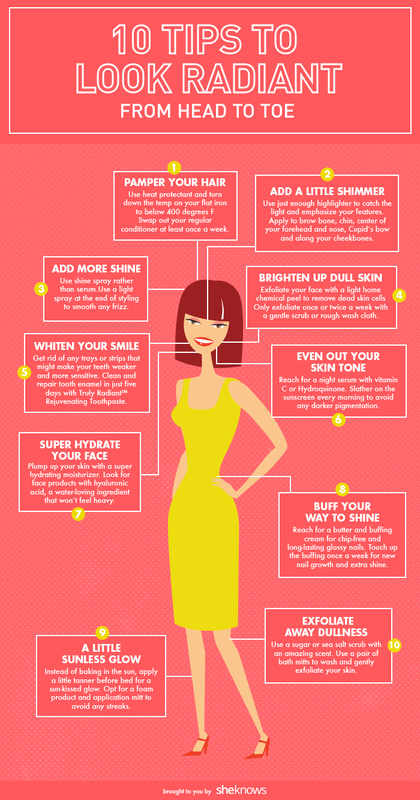 You’ll be glowing from head to toe! It is definitely easier to get healthy, shiny-looking hair if your hair is healthy and shiny. 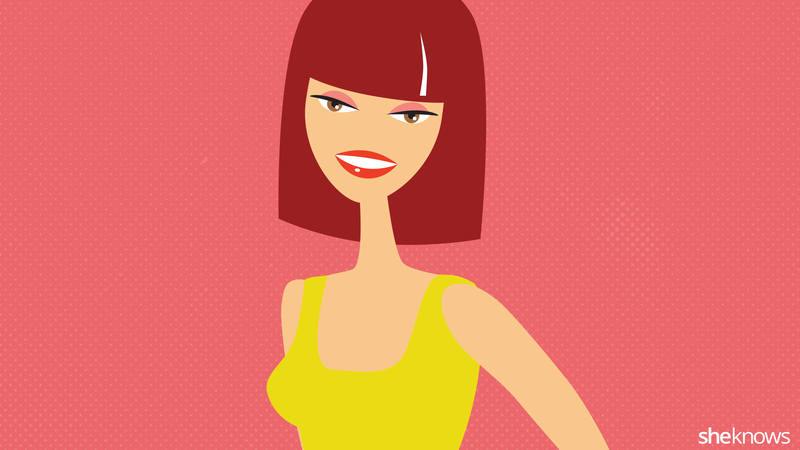 You should get your hair trimmed regularly to remove damaged areas. Avoid heat styling, or at least use a heat protectant and turn the temperature down on your flat iron to below 400 degrees F. Finally, swap out your regular conditioner for a hair mask at least once a week for a deeper penetrating treatment. Your hair will be healthier and shinier in no time! Even if your hair is already really healthy, there’s something about shiny hair that just screams health and vitality. Adding shine to your hair is a bit tricky; you want to hit the sweet spot of shine. Too little shine and you’ll wonder why you bothered. Too much shine and your hair looks greasy. I like to use a shine spray rather than a serum. A light spray over all of my hair at the end of styling will help smooth any frizz and add just the right amount of shine. Even if you’re washing your face twice a day, you need to be lightly exfoliating your face as well. The goal is to lightly remove dead skin cells, encouraging your skin to renew itself. You can use a light at-home chemical peel or a gentle scrub, but scrubbing your face with a rough washcloth will also get the job done. The goal of exfoliation is skin that feels smoother and clean, not red and irritated. Exfoliate your face once or twice a week to get a smoother, more even complexion. While exfoliating can help reduce unevenness in your skin tone, chances are that you also have a few areas of darker pigmentation. These areas age your face, and tackling them as soon as they appear increases your ability to remove them. Reach for a serum each night to treat these spots that contains vitamin C or hydroquinone. You should also prevent their appearance by slathering on the sunscreen every morning. It’s hard to look radiant when your skin is parched! Use a super-hydrating moisturizer to add much-needed moisture to your skin and you’ll also plump up the outer layers of your skin, making fine lines and wrinkles less obvious. Look for products with hyaluronic acid, a water-loving ingredient that won’t feel heavy on your face. Even if your skin is shiny, you can add a little shimmer to your makeup without looking greasy. Use just enough highlighter to catch the light and emphasize your features. I like to use a cream product and apply it with my fingertips as the last step of my makeup. Apply to areas that the light naturally hits like your brow bone, the center of your forehead, down the center of your nose, your cupid’s bow, your chin and along your cheekbone. If you’re fair you should be reaching for a white or pale-pink shimmer product; medium tones can use a Champagne or light-pink highlighter and those with darker complexions or olive skin tones will do great with gold-toned highlighting products. After you’ve spent so much time on your hair and face, it is easy to get sidetracked and forget about the most important part of looking radiant, your smile! I like to use Truly Radiant™ Rejuvenating Toothpaste, which goes below the surface to strengthen, clean and repair tooth enamel for a radiant smile in just 5 days! * Just swapping out my toothpaste is much easier than dealing with trays and strips, and the end result is a great smile! While you’re exfoliating your face, you shouldn’t forget about your body. Your body can tolerate more exfoliation than your face, and you should be exfoliating it! You can use a sugar or sea salt scrub, many of which come with amazing scents and will make your morning shower anything but routine. My favorite way to exfoliate my body is to use a pair of bath mitts, which gently exfoliate my skin while I’m washing. Even if you’ve embraced your pale like I have, a little sun-kissed glow can look amazing! Rather than baking in the sun to get that glow, I like to avoid damaging my skin and use a sunless tanner. I apply at night before bed, opting for a foam product and application mitt to avoid streaks. Once my skin is dry, which only takes a few minutes, I can put on my pajamas and crawl into bed. The light glow will be fully developed when I get out of bed eight hours later! Not everyone is a fan of brightly colored manicures and pedicures. While you could opt for a clear top coat, there’s a chip-free option that will still look glossy and lasts for weeks! Reach for a buffer and buffing cream; you can buff your way to nails that pull together your whole look but are very low-maintenance. You’ll need to touch up the buffing once a week or so to shine up your nails and buff new nail growth.